Spring time is the perfect time to go out and discover the variety of plant species found in River Legacy Park. Most plants at River Legacy are contained within the flowering plants, as are most plants around the world. These are known as angiosperms. They produce flowers and a fruiting body to protect the seeds once pollination has occurred. Species include the saw greenbrier (Smilax bona-nox), poison ivy (Toxicodendron radicans), osage orange tree (Maclura pomifera), Mexican plum (Prunus mexicana), etc. In addition to the flowering plants, there are 3 other major groups of plants with River Legacy representatives as well. The mosses constitute a group of plants that like to grow in dense clumps on a typically moist surface. This could be a log on the ground, the bark of a tree, a bench, a boulder, etc.. They are non-vascular, meaning they have no system with which to transport a lot of nutrients and water. They are also very short and produce spores instead of seeds. Ferns form the other major group of River Legacy plants. In contrast with mosses, ferns are vascular and are bigger. In addition, ferns have compound leaves divided into many leaflets. And, while ferns produce spores like mosses, these are located underneath the leaves of the plant instead of at the tip of the shoots. 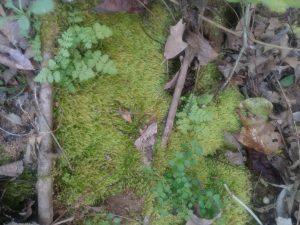 You might be able to find the bluntlobe cliff fern (Woodsia obtusa) along the trails near Snider Creek at the back of the Science Center parking lot. You have to look closely on the cliff itself to find this plant! The gymnosperms is another group of plants that produce seeds instead of spores. The difference between them and the angiosperms is that gymnosperms do not produce a fruit to protect their seeds. Normally the seeds are in the form of a cone. One of the gymnosperms that makes River Legacy its home is the eastern juniper or red cedar tree (Juniperus virginiana). Look for a 16 to 60 foot tall tree with light reddish or brown bark with leaves that look like needles instead of a typical leaf shape. Plants are awesome! We hope you will explore the trails surrounding River Legacy Living Science Center or in River Legacy Park so that you can enjoy them! 3 groups of plants are represented in this picture! Moss can be seen in the background, some ferns can be found at the top left-hand corner and in the middle right section, and a small flowering plant can be seen at the bottom right-hand corner! ← Mammals, Reptiles, and Creepy Crawlers, Oh My!